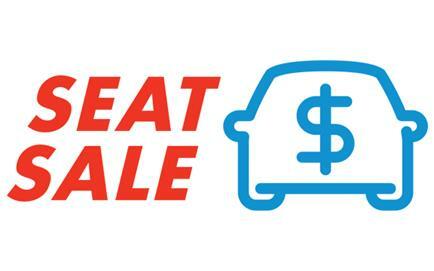 Check out our newest locations and find a new ride in our monthly Seat Sale! This year, we've added more new vehicles to our fleet than any previous year to keep up with demand, including locations in Richmond, Surrey and Vancouver! In addition to some of your favourite makes and models, we've been able to add brand new ones like our BMW X1, which is part of our Premium offering. Have you been behind the wheel of a new Modo? Snap a photo and share it with us online! Because why own a car when you can share 500? You can get behind the wheel of our BMW today and save 10% on your booking as part of our Seat Sale until September 15! Check out the section below to see other vehicles on sale now! NEW LOCATION at Richmond City Hall: Two 2017 silver Toyota Prius V (#819 and #820) are now located at City Hall. NEW LOCATION at JERVIS 1333: You can find a 2016 blue Toyota RAV4 Hybrid (#818) and a 2016 white Honda Fit in the alley between Harwood Street and Beach Avenue. The Toyota RAV4 is located in the garage on the left, the Honda Fit is on the right. CAR CHANGE at Grays Park: A 2008 grey Toyota Prius is temporarily filling in at Gray's Park for car #392. 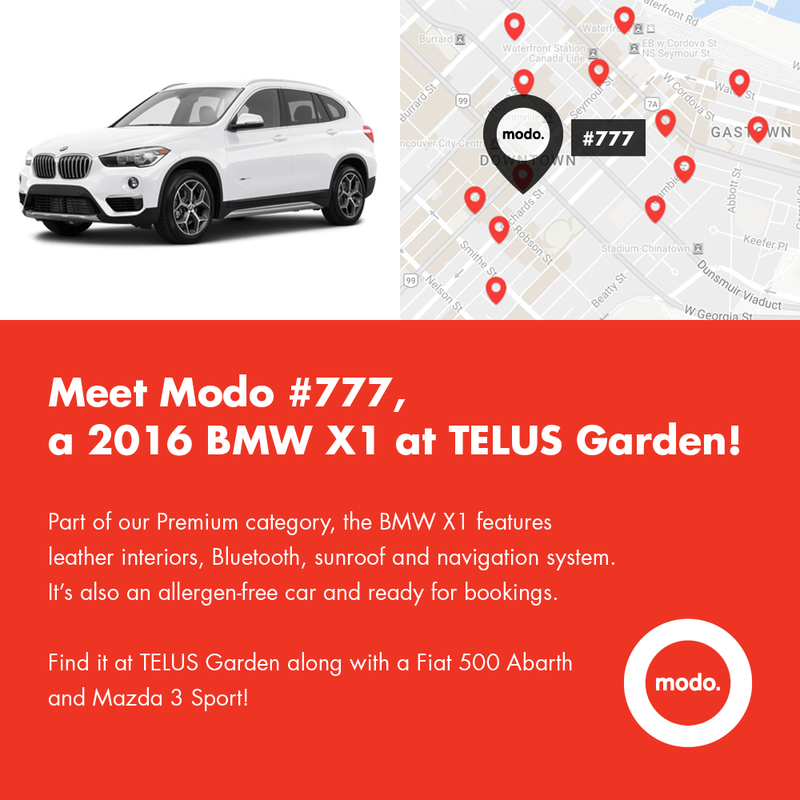 NEW CAR at TELUS GARDEN: Our 3rd premium car, the white 2016 BMW X1 (#777) is temporarily located at Telus Garden Offices, it will later move to Telus Garden Residential. CAR CHANGE at Modo Office Parkade: The 2014 silver Toyota Prius C (#584) is located at the Modo Office Parkade and will later move back to Telus Garden Offices. NEW LOCATION at Hull: Car #271, a 2007 orange Toyota Yaris, is now parked on the East Side of Hull Street, between Victoria Drive and East 20th Avenue. Did you refer any friends to Modo over the summer? 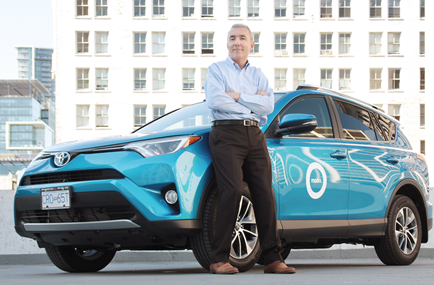 For every new member you introduce to Modo, we'll give you $25 free drive time! Read Anthony's tip this month for the scoop on Member Referrals. Meet the Thingery, Vancouver's first lending library of things. 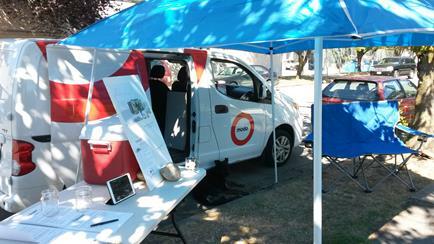 The first pop-ups were operated out of one of our Modo cargo vans located at Mosaic Creek park! Modo and Vancity are proud sponsors of this neighbourhood project which you can help grow in your community by donating. Click this form to get started! "Thingeries are going to be a centerpiece of the community — a place people can swing by and get to know each other.” — Chris Diplock via Metro Vancouver. 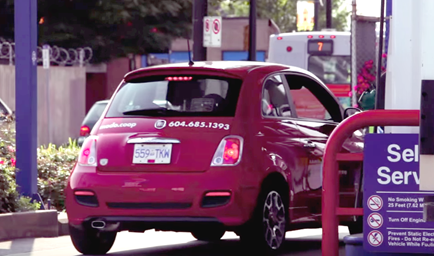 Modo covers the gas, so you might as well fill ‘er up! You can use our cards at Shell, Chevron, Petro-Canada, Superstore, and once again at Esso, or pay at any station of your choice and we’ll reimburse you with a receipt. Check our blog post on fueling up! This past year with your help, we focused our community investment in three categories. Take our Quick Poll to help us continue to support our communities! Starting August 19th and ending September 15th, bookings in these cars are 10% off! Starting August 26th and ending September 15th, bookings in these cars are 10% off! >> BUSINESS IN VANCOUVER In case you missed it, here's a great profile on our new CEO, Patrick Nangle, on BIV. >> MIXERS AND ELIXIRS Heidi Kuhn joins our team of Modo Ambassadors and shares how carsharing has helped her micro food business grow! >> MAIL FROM MUSK A little more patience is required, but we're excited about the two Tesla Model 3 we've reserved. >> 4 KIDS, 1 VAN, 2 TENTS Modo Ambassador Lisa Corriveau went on a Modo Camping trip with one of our 8-seaters. 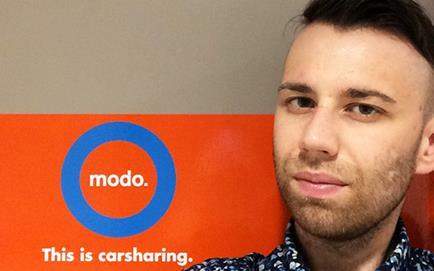 >> MODO ON AIR Modo's CEO was interviewed by Kirk Lapointe on Roundhouse Radio. >> MODO + FROGBOX The RADIUS team booked a Modo cargo van to move to their new office. Stay tuned for their opening party! >> YOGA, RAFTING, MODO Ambassador Anita organized a fun yoga retreat including a Modo ride. >> RUN WITH MODO Don't forget, members get 10% off the race entry for the almost-sold-out Eastside 10k using the code MODOMEMBER. 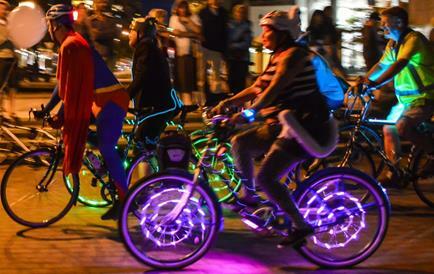 HUB Cycling's "glowtastic" event is taking place on Friday night. Cycle the streets of Kitsilano, Shaughnessy and the new Arbutus Greenway! Pre-Party starts at 6pm, meet at Granville Park. Get your tickets! The Eastside Culture Crawl is celebrating a special milestone at the Russian Hall, featuring art, music, entertainment and lots of dancing! Join the celebration! The TEDxSFU lineup promises an exciting event, featuring a Millionaire Entrepreneur, Miss Canada rights activist, Technology innovators and other speakers. Get your ticket!